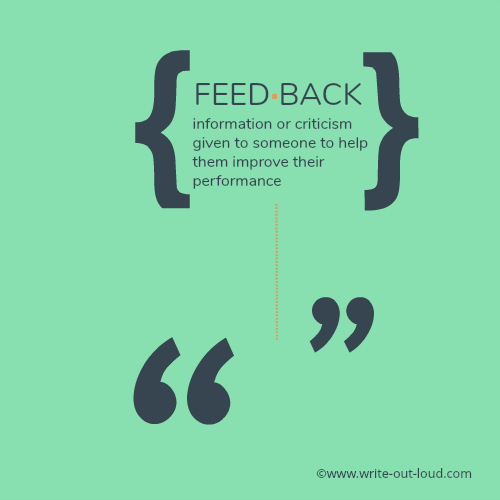 We learn through feedback. Yet one of the most important and potentially problematic aspects about public speaking is getting it. Not just any old feedback but useful, constructive criticism you can work with. Being told that you're fantastic is flattering. Being told that you've got a long way to go, or worse, is disheartening. However neither statement actually lets you know which aspects of speech making you need to focus on, or how to improve. To get the evaluation you need to develop your skills you either have to be part of a public speaking group (class), or find yourself a volunteer and train them to evaluate you usefully. Better yet is to find a partner. Teaming up with a buddy with similar goals within whatever organisation most of your public speaking occurs is a good solution and one that's worked really well for me. You take turn about listening and evaluating each other. Discussion will help you identify areas of strengths and weaknesses giving you specific aspects to concentrate an evaluation on. If you're working on transitions, that's what they'll pick up on. If it's eye contact and body language, the feedback will focus on that. Or it could be how you manage to integrate using powerpoint and a whiteboard. The possibilities are endless. When you're a member of a club or attend a public speaking class this form of feedback should be an integral part of a session. To be thoroughly useful make sure that the evaluation goes further than a mere statement that you could work on, for example, getting rid of stock phrases or fillers (ums and ahs). Becoming aware that you use them is good but the next step gives you the tools for improvement. This is the HOW step. What do you do to work on the problem? What is the best way to get rid of fillers? How do you avoid resorting to habitual or stock phrases? If you don't have ready answers, say so and offer to do the research to find them. You do not have to be an expert but you do need to be willing to learn, work for and trust each other. If you do you'll find sharing is hugely rewarding. Click the link to visit a page on my site to see what aspects of making a presentation or giving a speech is included in a formal speech evaluation. You'll also find suggestions covering how to work with an evaluation and a link to a printable evaluation form which you can download. The form is based on those I used in teaching and has a standard 5 point rating scale. March for Our Lives - thousands join anti-gun protests around the world. The impassioned speeches made by the young people who know first-hand what a gun in the wrong hand can do are heartbreakingly compelling. Open the link to watch a video highlighting five of them. I found them inspiring. Would you like to try writing a speech with an app? I've been working on an app to help a person write a simple, personalized speech in minutes and it's ready for testing. I'd really like to know what you think about it; in particular where, and how it can be improved. If you have the time (about 10- 15 minutes) to donate to a very good cause - me :) and my speech writer app, it would be very much appreciated. Let me know via the contact form on my about me page and I'll send you more details including the link you need. Thank you!